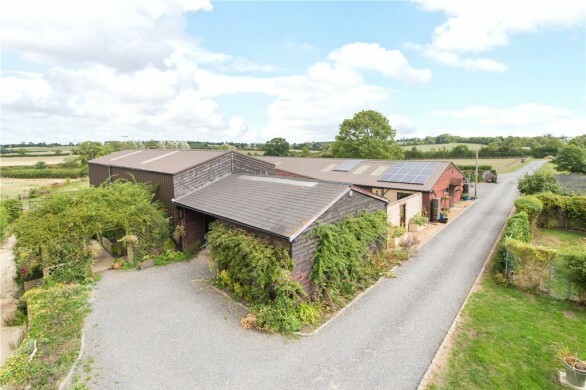 Meadow Valley Farm was re-built in 2008 to incorporate energy saving features including rain water harvesting, a ground source heat pump, heat recovery in ventilation and solar panels. 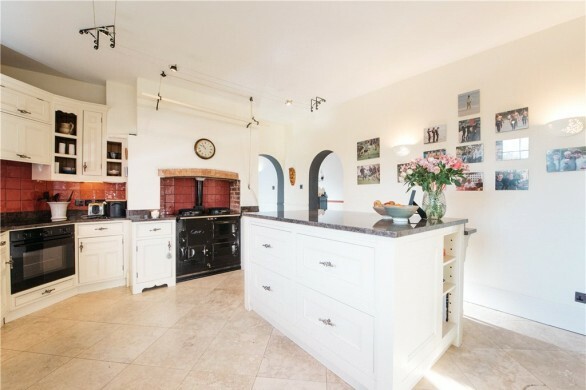 The accommodation includes a cellar, a kitchen/dining room, a utility room, three reception rooms, seven bedrooms, four en suites and a bathroom. 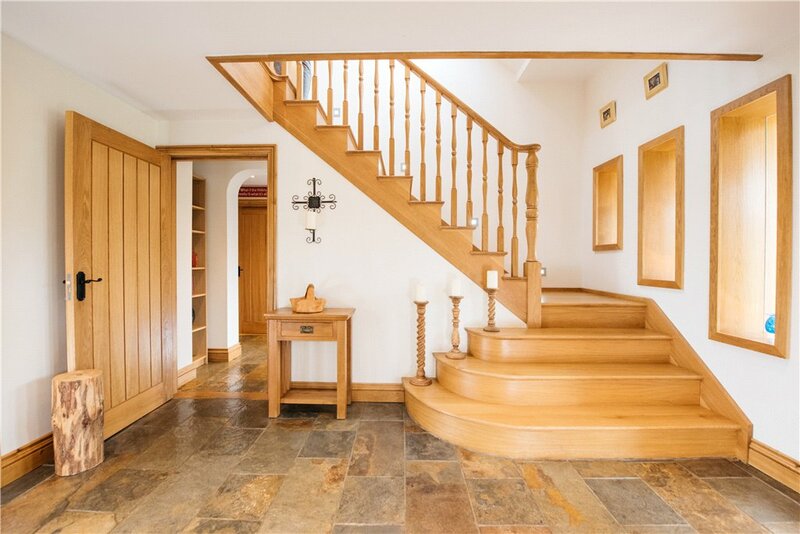 A hardwood front door opens into the outer entrance hall which has slate flooring and a door into the main entrance hall which also has slate flooring and solid oak stairs to the first floor. The sitting room is entered via double doors from the main entrance hall and has a log burner set on a slate hearth, and built-in speakers. Double doors from the sitting room open into the family room which also has built-in speakers. 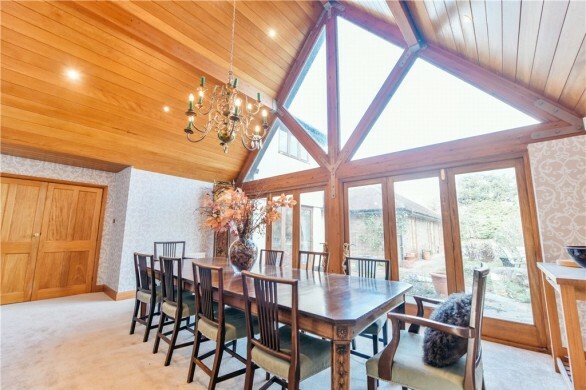 The study is accessed from an inner hallway and has built-in furniture. 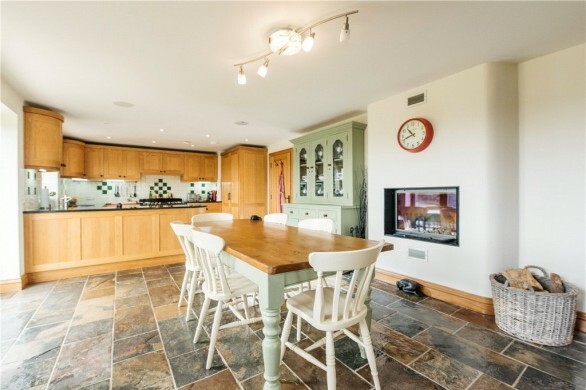 The kitchen/dining room has slate flooring, a log burner and built-in speakers. 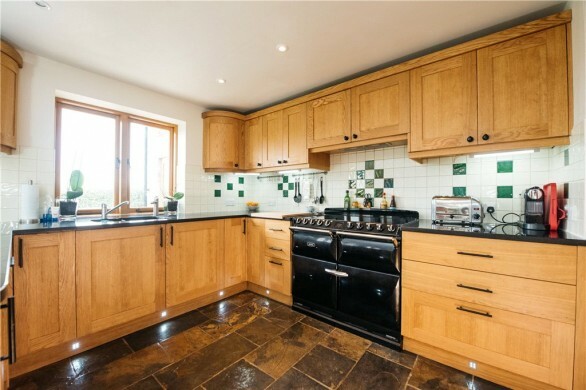 There is a sink and drainer with a boiling water tap, a range of oak units to base and eye level, granite work surfaces, space for a range cooker with an extractor over, a built-in fridge and freezer and an integrated dishwasher. The utility room is accessed from the inner hallway and has tiled flooring, a double sink, base and eye level storage units and a built-in tumble dryer and washing machine. A door from the utility room leads to the two piece cloakroom which also has a storage cupboard. 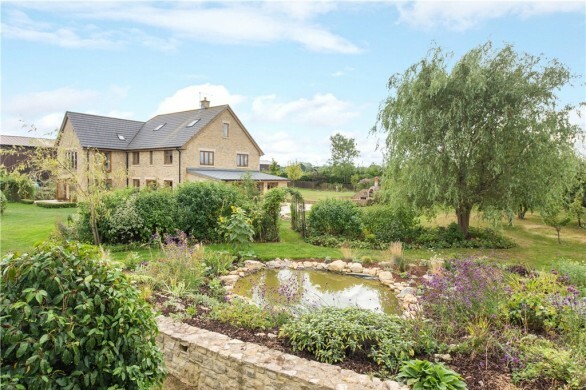 The ground floor bedroom has concertina doors to the garden, built-in wardrobes and a fully tiled en suite wet room with a WC, a wash basin and a double shower cubicle. The lower ground floor has a cellar area and a boiler room housing the ground source heat pump and the rain water harvesting system. 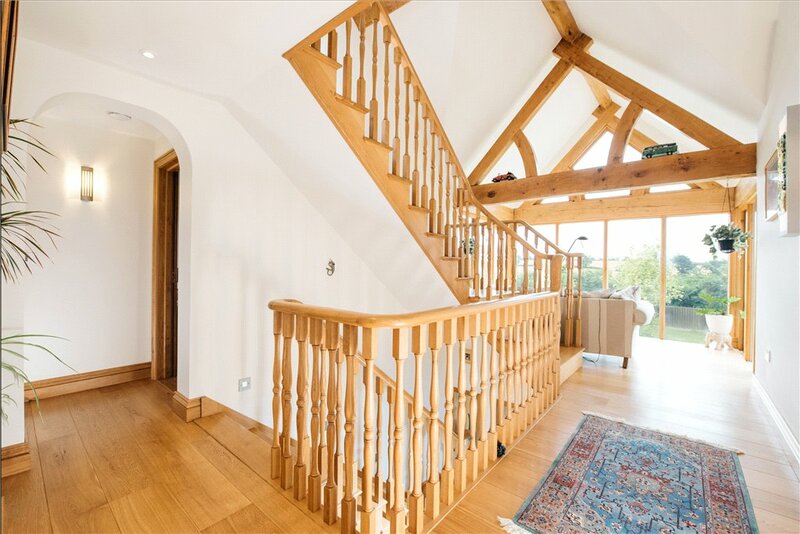 The landing has wooden flooring and an exposed ceiling timber, a storage cupboard and a further cupboard housing the heating manifolds for the under floor heating system. 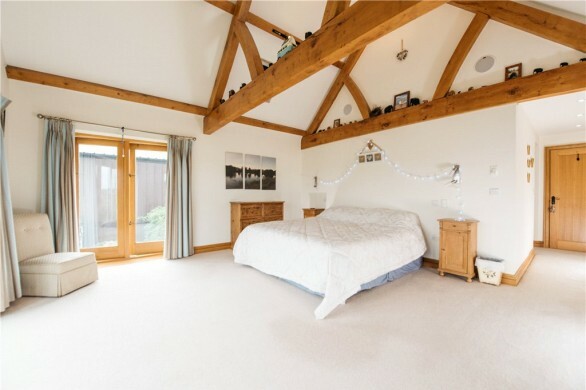 The master bedroom has a vaulted ceiling, exposed wall and ceiling timbers, built-in speakers, bi-folding doors to a Juliet balcony, and built-in wardrobes. The fully tiled en suite bathroom has built-in speakers, a WC, a wash basin with a granite surround, a roll top bath and a shower cubicle. 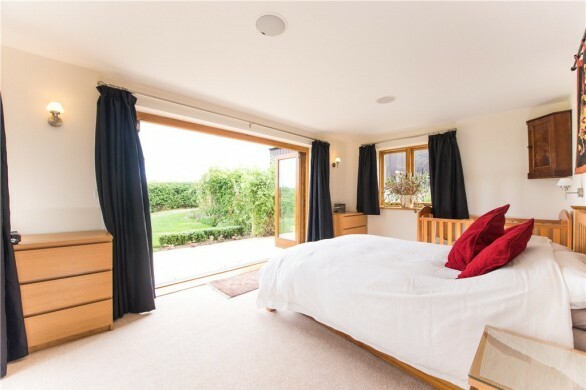 Bedrooms three and four have built-in speakers and en suite shower rooms with a WC, a wash basin and a shower cubicle. There is a further double bedroom with built-in speakers. 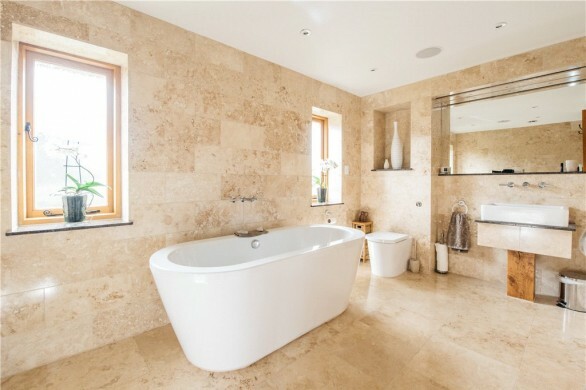 The family bathroom is fully tiled and has a WC, a wash basin, a panelled bath and a shower cubicle. 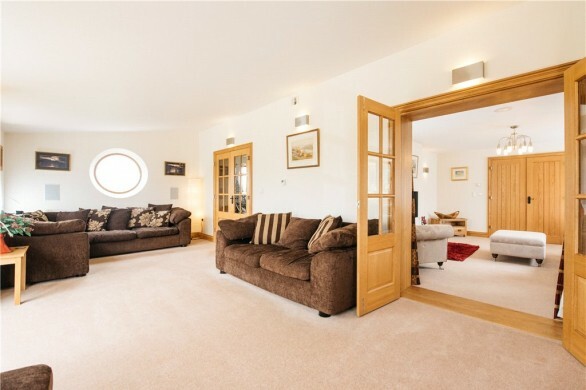 There are two double bedrooms on this floor - one is currently used as a bedroom/playroom. The property is entered via a metal five bar gate leading onto a gravel driveway which divides into two areas - one leading to the rear of the property and one leading to electric double gates and parking for approximately twenty cars. 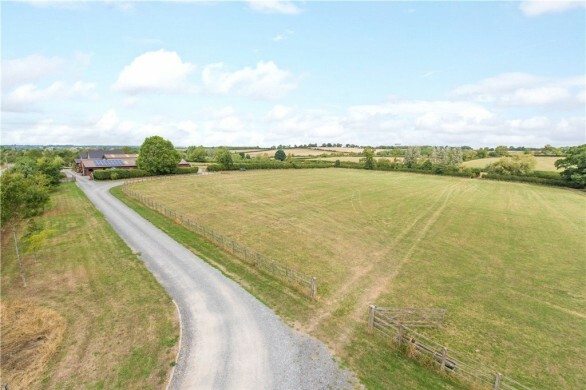 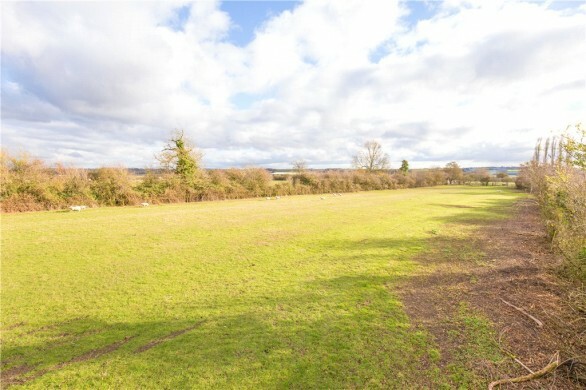 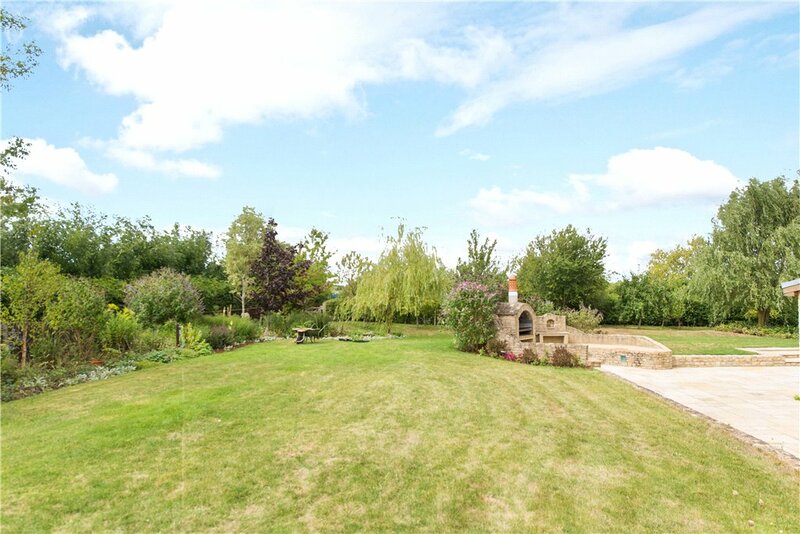 Potential buyers should be made aware that there is a public footpath that runs through the paddock land. The gardens cover just over 2 acres and have various areas including soft fruits, an orchard with a greenhouse, patios, a built-in barbecue, herb and vegetable gardens, a garden pond, rockery, and lawn areas with mature planting. 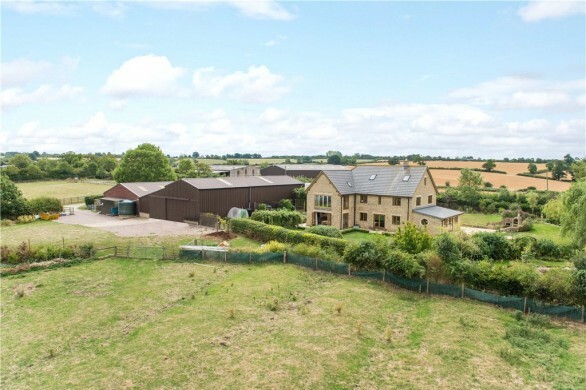 The barn is 8,777 sq. 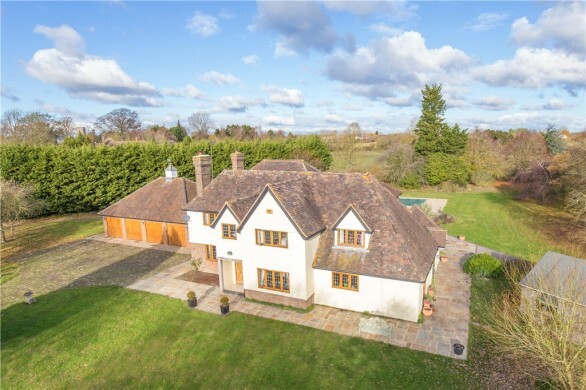 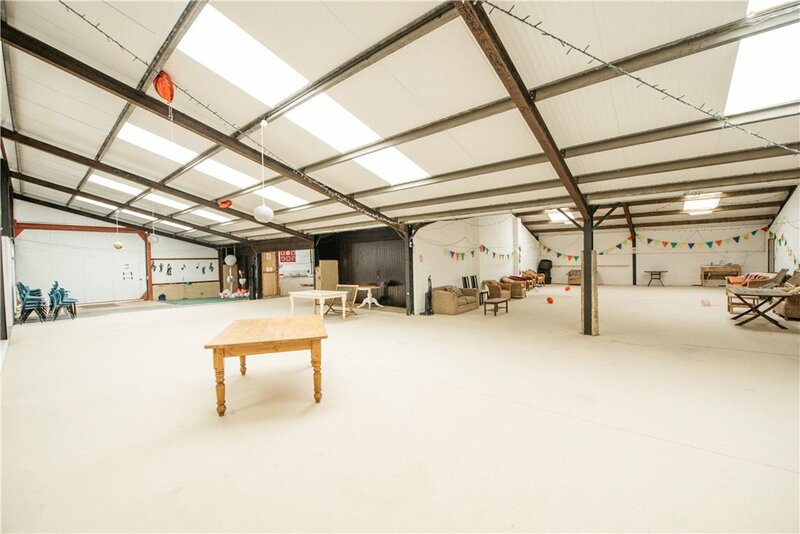 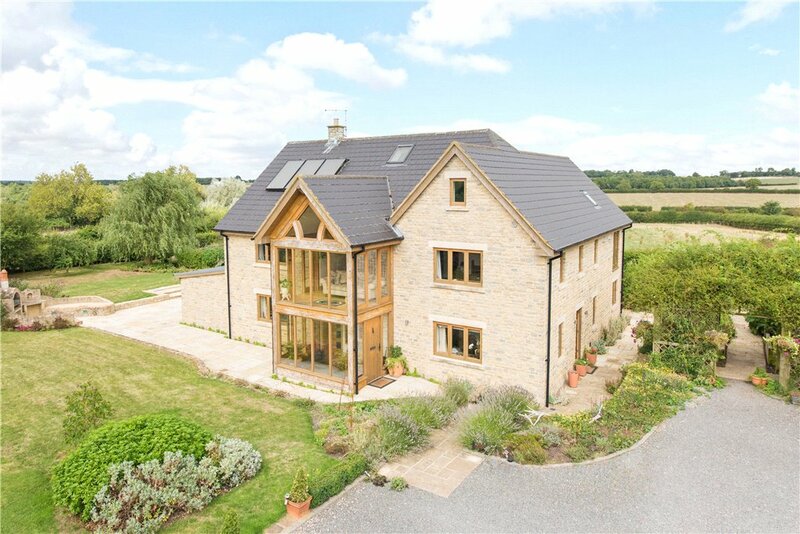 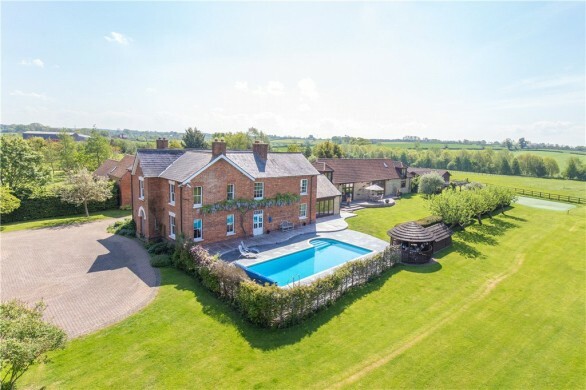 ft. and includes stables, storage rooms, a kitchen area and a cloakroom. 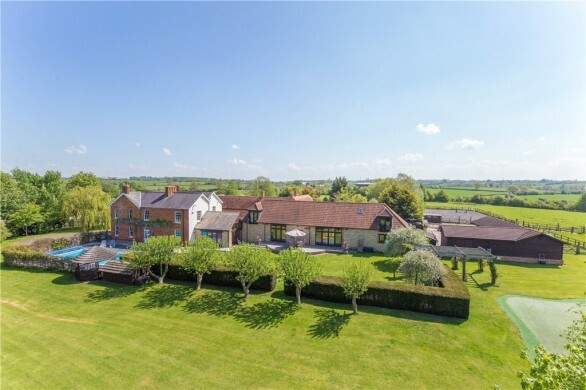 The village of Thornborough has a church dating back to 1237, a medieval bridge dating back to the 14th century and is surrounded by countryside offering walking and riding opportunities. There is also a public house, a primary school which is rated outstanding by Ofsted, a village hall, a sports field and a cricket club.